Needed a product key for a Win 7 machine before I reinstalled. I used the instructions on the following page to get me the product code. I required me to use PowerShell. The basic instructions are to create a .ps1 file then use two command lines to run the query. I updated a bunch of sites yesterday after the 3.6.3 release. When I went to add the login module the edit page was complete white with a drop down box. I was deeply concerned and thought maybe this Gantry template was the issue. It was not. I found this page. I refreshed the browser window and everything was fine. Basically came down to Joomla worked on their caching component and you need to manually refresh the page. Another install I upgraded simply refreshing the cache did not work. I was using Firefox. Firefox is making it tough to find the delete recent history. I had to close out of the administrative area all together. Open a new tab and then the modules were be having the way they should. The articles are a different story. When I go into edit an article I get the following message. We have a economy web hosting package we are setting up a Joomla (3.6.3) website with Virtuemart. Easier than I thought. Because the SSL was purchased with the hosting all I had to do is go to my products. Click on SSL, click on set up, and Godaddy does the rest. Sucuri Antivirus is a great service. I found an attack on a Joomla 3.5 site where a PayPal form and zip file were inserted into the images folder. New folders called “bt”, “BT”, and “mic” in the images directory. Are Placeholders 508 Compliant and Should They Be Used Over Labels? I have a cousin that is blind and fully uses the web. This is amazing to me. When I am building websites I often think about how my site could be used by people with life challenges. While redoing a site I wondered should I ditch the 508 compliant “label” tag and just use a “placeholder” tag. After some Google searches and good old common sense I have determined that label tags should stay. Placeholder text color can be an issue with some users. Placeholder text can be confusing to screen readers. I personally have no experience with screen readers, but have heard this from screen readers users. I read that placeholder text can confuse users into thinking the field is already filled out. I know labels are 508 compliant. This article was helpful with my determination. I am taking JS Jobs component out for a test drive. I posted a few test jobs from a test company and logo doesn’t show on the jobs page. I was able to get this to work by doing the following. In the file “components/com_jsjobs/views/job/joblisting.php” line 75, I added the following. Solved – Joomla 3 Localhost – Could not instantiate mail function. 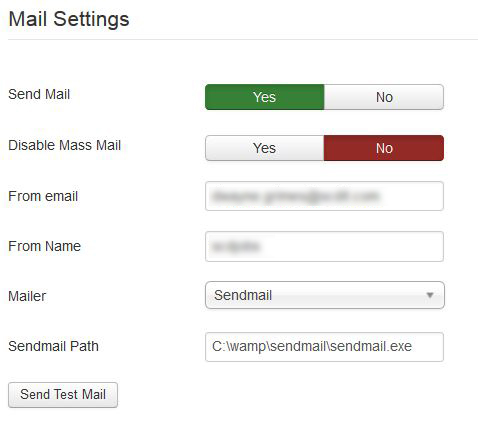 While working on a Joomla site in WAMP I went to test the email and got the following error. Here is how I fixed this. This could be the long way, but it worked for me. I had to set up sendmail. I wrote about my best solution for localhost in this post. Then in Joomla I went to Global Configuration >> Server tab. At the bottom is “Mail Settings”.